Where are the real Gandhis? Ramchandra Gandhi, a philosophy professor at St Stephens in Delhi University, University of Southampton in England and two other institutions passed away in a guest room at the India International Centre, New Delhi on June 13. If you haven't heard this, I won't blame you. For the record, Ramchandra was a grandson of Mahatma Gandhi. 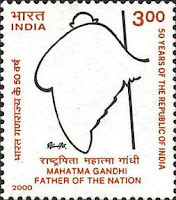 The Gandhi Serve organisation states that there are 54 direct descendants of MK Gandhi. But, where are they? Why aren't they playing an active role in the political system? Strangely, Mahatma Gandhi has gone down in history as a solitary figure, battling the Evil Empire. His sons and grandchildren seem to have been abandoned to oblivion. What we have instead is a revival of the 'Gandhi' brand with Pandit Nehru, Indira and Sonia. Gandhi's simple ideal of democracy was replaced by socialist principles as soon as Nehru came to the centre stage. It's unfortunate that none of Gandhi's children were given any position of statehood that would have kept them alive in public memory. All of Bapu's sons - Harilal, Manilal, Ramdas and Devdas - led their own little lives. Harilal died in obscurity because of his seperation from his father. Manilal spent his life running his father's paper in South Africa. Ramdas was active politically, but not enough to get him to a prominent position. Devdas went into journalism and led a quiet life. Their children are scattered across continents. Some of Bapu's grandchildren run missions abroad. Ironic, considering that MK Gandhi was a staunch swadeshi. One does wonder, though whether Gandhi himself is responsible for this. He did not care much for political accolades and it is doubtful whether he would have supported his children's political careers. Instead, he sent them off in different directions. When Manilal Gandhi's daughter, Uma Duphelia-Mesthrie released her book Gandhi's Prisoner? The Life Of Gandhi's Son - Manilal in South Africa, she alleged that Manilal's life was completely directed by his father's wishes. It seems unlikely, though not impossible, that there will be a rebirth of the 'real' Gandhi family in Indian politics. Indians seems to prefer the romanticized version of the Nehru 'Gandhi dynasty' instead. I'm glad that Gandhi's descendants live in obscurity - for their sakes - hard to be known as Gandhi's descendant, you'd have to be all saintly and non-violent. Plus why should we expect them to do as their father/grandfather did ? What about lives/desires of one's own ? And yes! may be soon to be released film, 'My Father Gandhi' answers your question. Hi. As far as I know, here is a website that has tracked the descendants of Gandhiji.